Thanks for all the kind notes and reminders to get back to posting on Sanity Fair! It's been a crazy month (March), followed by a crazy few weeks (April), and this poor blog has been the victim of oh so much scheduling insanity. But, I'm finally back, with some fun spring things in store. First up: it hasn't been allll work in recent weeks. I did have time to do a little redecorating around the S.F. pad. 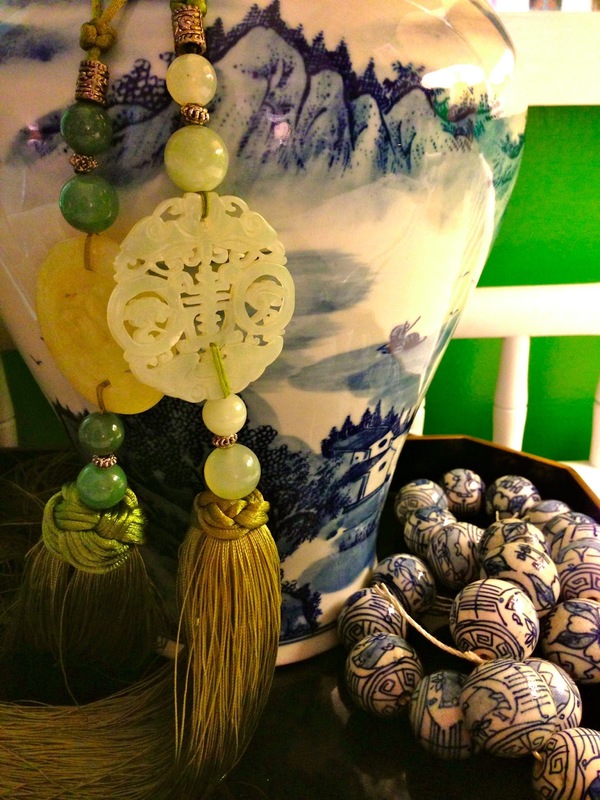 I picked up this large urn, jade tassels, and beads on a trip to Asia. I haven't figured out where I'll put them yet, but for now, it's been inspirational having them all piled on my desk. 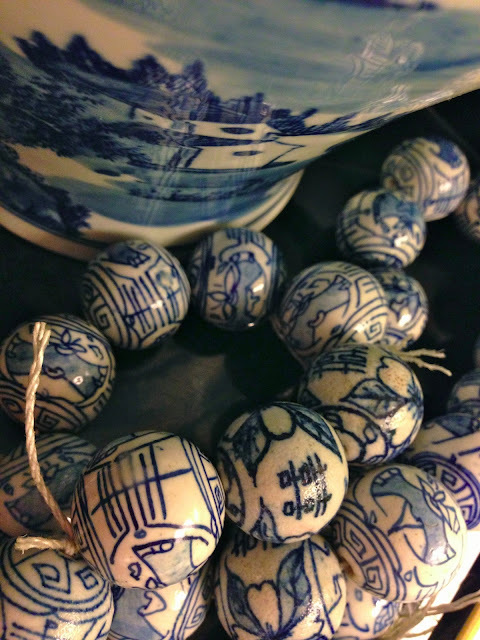 There were ropes and ropes of these giant ceramic beads in the market stalls - I wish I'd bought more! 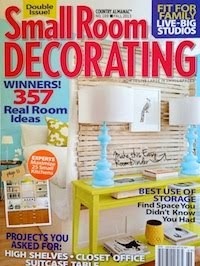 As you know, green and blue is one of my favorite color combinations. I bargained hard for a set of four bronze pagodas - it's so hard to find large ones! The tall pagodas are over a foot high, and I was thrilled to find them. I set up this brass quartet flanking the TV. Excuse the bad lighting and total lack of styling.... In real life, the golden color of the pagodas picks up the brass hardware of the credenza, the sunburst mirror behind, and a number of other brass elements sprinkled through the living room. Outside, this is what my sidewalk looks like. I'm so relieved it's spring! It's good to be back. More to come! 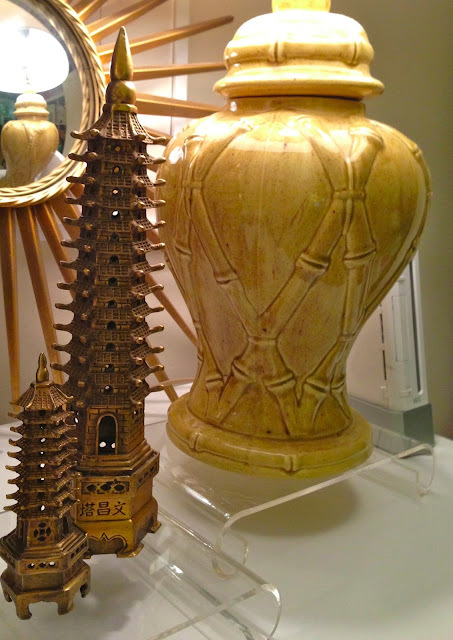 I love all of your Chinoiserie finds! Very inspirational just what I need right now. lol - sorry TPP :) But we're all even! I want ALLLLL of your blue and white ginger jars!! Welcome back, Skyla! You were missed!! You picked up some incredible treasures while you were away. So lovely! Love all of your finds.